The first time I made this, it was "four for ten dollars" lamb shank season at my local markets, so I made the recipe with lamb shanks, which I asked the butcher to slice into halves or thirds to resemble the classic "Osso Bucco" veal shank cut. Works a treat! This time I did it the proper way with the correct cut. So basically I use "some shanks", toss in plain flour seasoned with salt and pepper, then brown all over in a heavy based pan in olive oil. I use an onion, half a garlic clove, three carrots and three celery sticks as I love all the trimmings just as much as the meat. Once cooked and softened I then add Kalamata olives, pitted and halved lengthways; a squeeze portion of tomato paste (you know you get those four to a box tinfoil jobbies from the supermarket? ); 2 cups of wine & 2 cups of chicken stock from a box. I still use bay leaves and thyme and sometimes I add greek oregano/marjoram/parsley or rosemary in case of lamb, just depending on what's growing riot on the balcony. I usually forget to get the citrus fruits proper but I always have that bottle lemon juice in the fridge so I just squirt in some of that (and definitely leave out the orange if you're using lamb) and add back the shank slices. I must admit the lemon zest definitely gives the dish a great kick, as does a snifter of chili if you are so inclined. Then for the simmering uncovered, to be honest I have gotten away with 20-30 mins of a "generous" simmer (ie boil down) in a rush, but 45-60 mins of a gentle simmer is ideal for that perfect melt in your mouth meat heaven with bonus goopy bone marrow joy - as well as a helping to fragrance the house for the next day or two! I serve on top of herbed (yes more herbs) cous cous - I just use the dry box stuff and pour over 1:1 boiling water with lots of chopped herbs, a tiny squeeze of lemon and fluff it with a fork. I don't personally love polenta that much, and I find the cous cous soaks up the flavour really well. Just remember though it seems to keep swelling up in your tummy, so be careful not to scarf down too much in the first go! ...and if you don't have any cous cous, pasta is pretty good too! 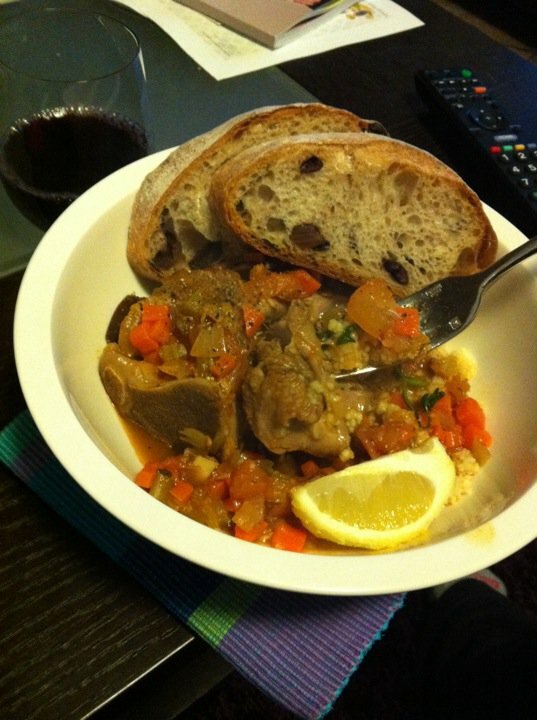 I can do lamb shanks but don't really like osso bucco, glad you found a fab recipe though- they can turn up anywhere! Those Neil Perry/Qantas Magazine recipes are ace!